For optimal health, Americans should try to increase their fruit intake to comply with the recommendations of ChooseMyPlate.gov. Pears and apples are two fruit options available year-round in the United States and are easy to include in your diet. It can be difficult to balance the risk and benefits of eating the skin of these fruits, factoring their beneficial nutrients and potentially harmful pesticide residues. A medium apple without the skin has 2.1 g of fiber, while the same apple with the skin has more than double that amount of fiber, or 4.4 g. Eating a medium pear with the skin will give you 5.5 g of fiber, while removing the skin will cut your fiber by more than half. In addition to containing a large portion of the fiber found in apples and pears, the skin of these fruits also contain most of the nutrients and antioxidants that are important for your health. Not eating the skin could prevent you from getting the full benefits of these healthy fruits. 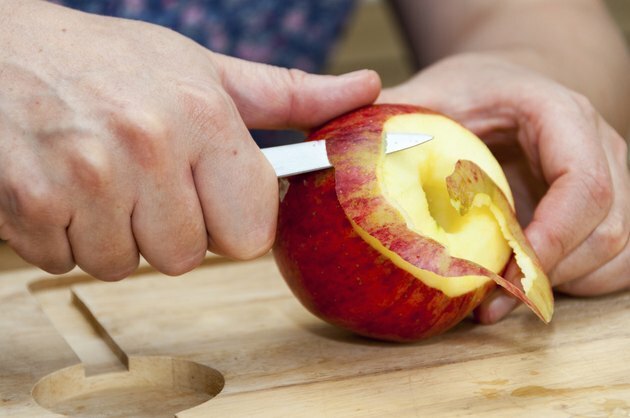 Some people remove the skin of apples and pears because they are concerned with pesticide and chemical content. Washing your fruit thoroughly under running water is usually sufficient to remove most of the residues that can be found on apples and pears. However, because apples are often waxed, it may be difficult to get rid of all the pesticides left on the skin. The Environmental Working Group suggest buying organic apples to decrease exposure to these dangerous residues. However, pears have very low levels of pesticides and you can safely buy the traditional version. If you are worried, opt for organic pears. Choosing organic apples and pears will allow you to eat the skin without fearing the potentially dangerous effects of the chemicals that can be left on the skin of conventionally grown fruits. To boost your fruit intake and benefits from the nutritional value of unpeeled apples and pears, try including one to two servings of these fruits in your daily diet. For example, you can add diced pears or apples to your oatmeal at breakfast or spread apples or pear slices with peanut butter as a snack. Apples and pears also make a satisfying snack on their own or combined with a few cubes of cheese. If you suffer from hives or urticaria, a skin condition, it may be best for you to avoid eating the skin of apples and fruits. Whether you choose organic or traditional fruits, most fruits contain a natural food chemical called salicylate, which is produced by the plant to protect its seeds against insects and other invaders. People with hives or urticaria are often sensitive to salicylates and should peel their apples and pears to decrease their salicylate content and allow them to eat these fruits without worsening their skin problem.